C. Julius Solinus wrote the 'Wonders of the World' or 'Collection of Memorable Things', probably in the mid-third century AD. He unblushingly plagiarised material on ancient curiosities from Pliny's 'Natural History' and other works to create a gazetteer of geography, historical events, religion, customs, and natural history. Revised in the 6th century under the title 'Polyhistor,' it became very popular in the Middle Ages, although its title was mistaken as the author's name. The 'Wonders of the World' included a short section on the British Isles and Ireland, and introduced the name ?Mare Mediterraneum? (Mediterranean Sea). The makers of this manuscript filled out Solinus's history with other works, classical and medieval, on the world, especially ones that would aid understanding the 'wonders' in Christian terms. 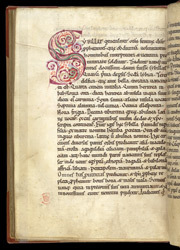 This page begins a copy of a chapter on the sybils or ancient female prophets, from the 'De natura rerum' ('About the Nature of Things') of Hrabanus Maurus, a Carolingian author. The text lists all the famed sybils of ancient Greece and Rome--from Persia, Libya, Delphi, Eritrea, Samos, etc.--passing on the information about their history. The Christian importance of the sybils was that they showed God's grace, the gift of prophecy, to the world and also that they may provide clues to the events preceding the end of the world.